For Week 2’s homework in my NYU-ITP intro to computational media course, we were supposed to rotate, animate, and translate an image. For my homework, I mostly wanted to play with animation via translation, not rotation, and I wanted to mess with the mouse pointer’s coordinates, having seen functions and variables for them in the Processing cheat sheet. I was also looking for 8-bit sprites while in class and found that many libs existed. One of my questions: how feasible is it to draw a 50×50 sprite into Processing like, say, a sprite of Mario? Anyway, somehow I happened upon Nyan Cat, an internet meme featuring a flying Pop Tart-bodied cat, accompanied by a fast-paced cute cat song. “Nyan” being the Japanese equivalent of “meow”. In keeping with my goal of doing happy projects at ITP, Nyan Cat seemed perfect! Here is the Java version. background(0, 68, 120); // sets nyan cat blue bg! 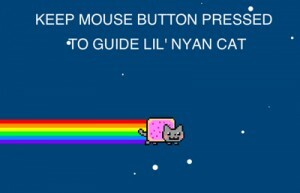 // lets you guide nyan cat, and also admire him while stopped! I had to end up using translate for having Nyan Cat orbit the mouse. I basically set up a diamond-like x-axis and y-axis stepping switch() function for positioning Nyan Cat and slowly orbiting him around the mouse. I probably, if I had more time, could have figured out how to do a proper elliptical orbit and also use scale() to make Nyan Cat appear further away or closer (for hugging) during the orbit. I added stars by randomly selecting points in the drawing area and then making x randomly sized ellipses at those coordinates. I couldn’t make them burst like in the original animation, because I’m not sure you can do much actually animation for more than one layer, since the background is erased through each draw() pass, via background(). Also found that I couldn’t make Nyan Cat destructive (only one on screen) while making the trailing rainbow non-destructive (leaving a trail). Again, background() has to be called to clear the background for each draw() pass. Right? I played with the mousePressed variable to see how an event can run separately when mouse input is detected. Nyan Cat and his rainbow were imported graphics via a sketch uploaded to OpenProcessing.org by Elie Kahwagi. Full credit toward that dude’s sketch, located at http://www.openprocessing.org/visuals/?visualID=33045 . 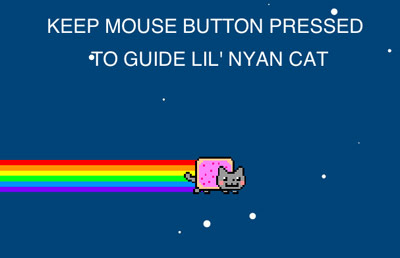 The best part about Nyan Cat? There are now international Nyan Cats!